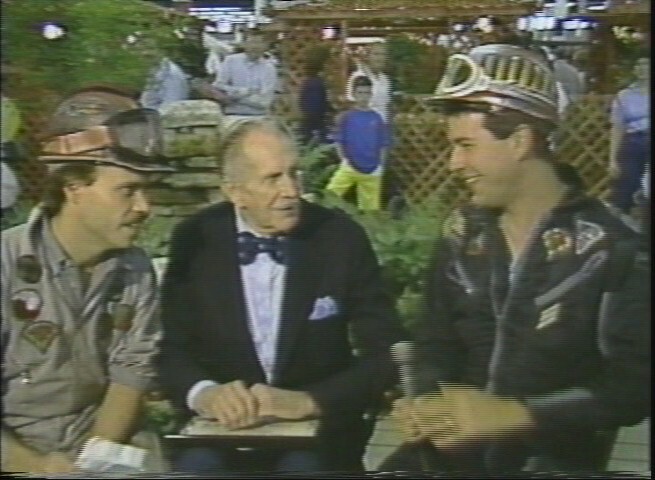 In the mid-1980’s The Texas 27 Film Vault was the show to watch on Saturday nights to see “Film Vault Technicians First Class” Randy Clower and Richard Malmos show and mock bad and campy movies preceded by episodes of old Republic serials. Machine-gun toting Randy and Richard would also have comedic sci-fi adventures before and after commercial breaks. Balladeer’s Blog continues its examination of this neglected cult series via my research into really old newspapers, my interview with Randy Clower and recollections from my fellow fans of this show. Keep those emails and comments coming “Vaulties”. Here’s my latest review of the movie shown by Randy and Richard when a date can be verified. EPISODE ORIGINALLY BROADCAST: Saturday August 9th, 1986 from 10:30pm to 1am. * Special thanks to my fellow T27FV fan Spearman for the date. 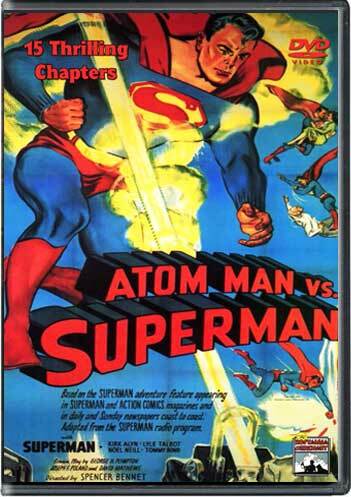 SERIAL: Before the movie an episode of the 1950 Columbia serial Atom Man vs Superman was shown. Kirk Alyn starred as Superman with Lyle Talbot as his archenemy Lex Luthor. Lex has his own secret identity in this serial – each episode he dons a lead mask and oversees the villainy as “Atom Man”. This was one of the liveliest and most campily watchable serials of the 50’s. Especially laughable are the bits when Superman “flies” – an effect achieved by switching from live footage of Kirk Alyn to INSERTED CARTOON FOOTAGE of Superman flying. Think of the ‘Toons in Roger Rabbit interacting with the live backgrounds and you have the idea. FILM VAULT LORE: The previous week our boys of the Film Vault Corps (“the few … the proud … the sarcastic”) had shown The Story of Mankind, another film with this episode’s interview subject: THE Vincent Price. 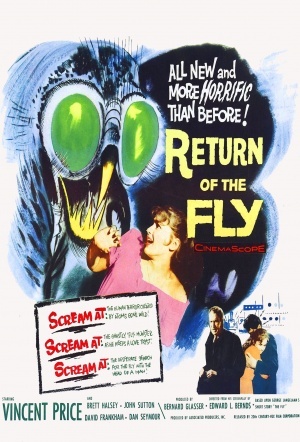 Like this week’s showing of Return of the Fly it was used to promote Randy and Richard’s upcoming public appearance at the Dallas debut of David Cronenberg’s remake of The Fly. (More on that public appearance after the movie review) Spearman also tells me this August 9th episode also featured R&R’s interview with Vincent Price. 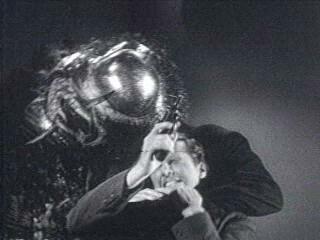 THE MOVIE: Return of the Fly is a black and white sequel to the technicolor original film. Brett Halsey, who played driven and tormented teens in a few films back then plays the driven and tormented Philippe DeLambre, the son of Andre DeLambre from the original film The Fly. It’s supposed to be 15 years later, but Vincent Price, reprising his role as Francois Delambre, Andre’s brother, hasn’t aged a bit! Philippe is obsessed with finishing his father’s work in perfecting a matter transporter, like the kind on Star Trek years later. Francois will have none of it but reluctantly gives in when Philippe threatens to sell his half of the family business to finance the research himself. Because of the dark stories people tell about his father’s fate, Philippe freaks out around flies in some unintentionally HILARIOUS scenes. Whenever our hero hears a fly buzzing around he stops talking in mid-sentence, stops moving and looks around in a wild-eyed panic. For the life of me he looks like he’s thinking “Oh my God, WHAT’S THAT NOISE? I’M SCARED!” Angry fits in which he makes a point of killing every fly he encounters might have been less absurd. Along the way we get a HYSTERICALLY funny look at a fly with Brett Halsey’s head superimposed on it. Think of David Letterman as “Head of Homicide” in that one sketch in the 1980’s with his disembodied head superimposed on a cop car’s chassis. You’ll also roll on the floor laughing at the sight of a man with guinea pig parts and a guinea pig with man parts … more transporter mischief caused by Alan. 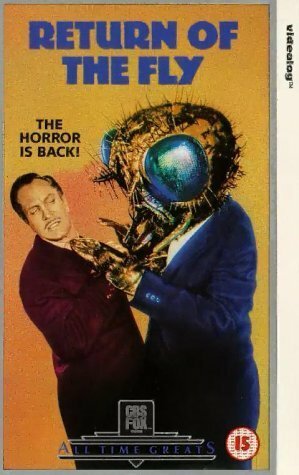 SPOILER: It all ends happily this time as Halsey in monster form kills off all the bad guys, and then the fly-man and man-fly are both captured alive. They are placed in the transporter together and Philippe is made whole once again. MORE FILM VAULT LORE: As for that public appearance at the Dallas premier of Cronenberg’s The Fly: This was a promotional stunt cooked up by Randy and Richard’s new producer – Greg Bransom, who was Movie Host royalty himself, having played Professor Cerberus on The Museum of Horrors in 1970’s Dallas. “We were to show up as the Film Vault guys at the movie theatre. People were told that if they dressed as Film Vault personnel they’d get in free. Well, Rick and I weren’t in a great mood that night. Didn’t really want to make any personal appearances that evening since we were both fighting with girlfriends and such. We grumbled all the way to the theatre. We really didn’t expect much of a turnout. “When we arrived there was a line around the place and 50% of those in that line were dressed in Film Vault-styled uniforms of their own creation, most of which were better than ours! We were FREAKED! Rick, who is usually the most extroverted guy you will ever meet in your life, got a panic attack and almost didn’t go in. “I loved it and (dragged) him along until we were both having a blast with the crowd. It was our first realization that this tiny late night show actually reached people and that we had fans! I think Rick felt for a moment that we didn’t ‘deserve’ such attention and geeked. Incredible! And the best part is the show came before MST3K! Awesome stuff! Loved the way u include bits about the show in with these reviews! Randy and Richard should definitely appreciate the attention u brought to this forgotten show! Thank you very much for all the kind words! Spread the word! Big ups dude! Very funny review and very nice historical context for The Texas 27 Film Vault! Fantastic way you’re sharing info on this show that definitely paved the way for big things. Thanks! I appreciate that! Spread the word! Always glad to hear from other Vaulties! Yay Randy and Richard! They are my new heroes! YAY VINCENT PRICE! Good to see him in that photo with Randy and Richard! Ya gotta love Vinnie Price! Thanks for sharing this! These old shows deserve attention. I’m glad Randy and Richard had fans back then who got to show their appreciation at that showing of The Fly. No problem! I agree with you! Holy Hell! This show was on the air even before MST3K let alone Rifftrax. I really love Vinnie Price! And Randy’s kinda cute. Thanks for the comment! I will let Randy know what you said! Awesome! They were like the grandfathers of Rifftrax! Awesome! This show sounds like it rocked! So wait. Which show came first? The Texas 27 Film Vault came first and then MST3K came along a few years later. Nice post. I’m a huge Vincent Price fan and would have loved to get to meet him and talk to him! This show was ahead of it’s time! Randy and Richard needed better pr or marketing people. I agree. 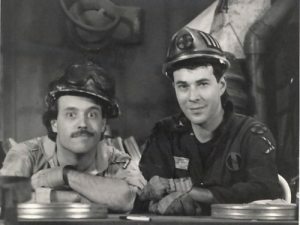 Greg Bransom as their new producer in 1986 was an improvement but still, this show should have caught on like MST3K did a few years later. Maybe if the Comedy Channel had launched a couple years earlier. Who knows? These guys just imitated everything Mike and the bots did. Actually The Texas 27 Film Vault was on the air a few years BEFORE MST3K. I can never get enough of your movie host posts about this awesome show! It’s just an imitation of the first movie almost. In a lot of ways, yes. I like your reviews! Was this the show with that talentless punk Frank Coniff? No, that show came later. This show was a missing link between the old horror hosts and MST3K. A lot of people certainly say so!